But then, the time came to go home, and the weather wasn’t very good, so I filed far for the flight back from Sewanee, Tennessee, back to Raleigh-Durham. And Field Morey and I had often chatted about what phases of flight are, you might say, where things happen. And we commented on the fact, or he had mainly commented on the fact that it was usually when you changed something that things went wrong. In other words, for example, if everything was flying smoothly, and then you suddenly put down the flaps, and the flaps didn’t work, that’s when things would go wrong. Or if you were climbing out with, to certain parts, I think things wouldn’t go wrong until you altered the power. So, we together had commented that the best way to avoid problems with an aircraft is not to change anything during critical parts of the flight. So in other words, just don’t touch anything. And so I was doing this without really particularly thinking about it, on that day. And then, leveled off at the assigned altitude, and throttled back to a non-climb power setting, because now, I’m no longer inclined, but just flying IFR at the assigned altitude. And then, given clearance to climb higher, and trying to push the throttle in. And it wouldn’t go. I mean, I didn’t push very hard, but I couldn’t move the throttle; I couldn’t push it in. And so I debated at that point what to do. Maybe one should land, and find out what the problem was. But it was rather nasty IFR, and I was in a region where I never made any approaches at any nearby airports, so I made the decision to not do anything, just leave things alone even though I had reduced power, and just tell the flight, the air traffic controller that I couldn’t climb very quickly today. And so, I proceeded in this way, and remember reaching Charlotte’s airspace, and then being given the instruction, “866 (note: this was 756XP), we need you to descend,” I think I was at 8,000 somewhere, around about there. And I said, “Oh,” I think I hesitated for a moment thinking will I go down, or — and then thought, no, that’s silly. I won’t go down, I’ll go up. And so I said, “I’ll climb, but I’ll climb slowly again,” and I climbed up to the appropriate altitude. And then, I hadn’t told air traffic control anything about what was happening, until I got to a point where now I can find out what the weather is at Raleigh-Durham. And I found out the weather was reasonable, and so at that point I said, I contacted the Charlotte control and said — or Washington Center, it was at that point, “Washington Center, Seven-Five-Six X-ray Papa, with a problem and a request.” And they said, “OK, what’s your problem, and what’s your request?” And I said, “I’ve got a stuck throttle, and I’d like clearance to 6,000 across Raleigh-Durham, and landing on runway three-two,” which was the little runway, I would have thought I would be well out of the way of anything else if I had a problem, I could just land on the little runway, and they cleared me for that. They cleared me this way, and so I headed back home, and now knowing what I would do. And then, as I approached Raleigh-Durham, the approach control said to me, “Seven-Five-Six X-ray Papa, we’ve got this 10,000 foot runway. Would you like to land on that runway?” I said, “That sounds like a good idea to me. Yes, I would, I would. I’ll take that.” And so I lined up on that. But the descent down to the landing was a little unusual, because I didn’t want to move the throttle, and yet I wanted to get down, and so the best way to get down was to put the landing gear down on full flaps, and then increase the air speed to the maximum allowed with flaps down and gear down, and get down by increasing drag. And that’s how I’d been descending. And Nobuyo was in the backseat sleeping; she often did that during flights. And then as we were on final, she looked up and said, “Oh, look at all those fire trucks. I wonder who they’re for.” And I said, “Well, as a matter of fact, they’re for us.” (laughs) And so the fire trucks were there, although I hadn’t asked for them, and we landed, and actually it was no problem at all, because I could pull the throttle back I found, though I couldn’t advance it very far. So I cleared the runway and taxied back to the place where the aircraft was eventually going to be stayed, and shut down. And, then I tried to move the throttle, and I found that in fact, it was jammed now, fully off, so it had been — it would not have been wise to have pulled it off, because I might not have been able to get it back on. 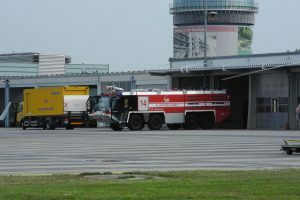 I thought it was nice to acknowledge the help of the tower in giving me — in suggesting and giving me the longer runway, and in looking after me by bringing the firetrucks out even though I hadn’t asked for them. And so I called up the tower, and I said, “This is Seven-Five-Six X-ray Papa, I’d like to thank you for your help.” And he said, “Oh, you were lucky, weren’t you?” And I said, “No, I wasn’t lucky at all. Luck was not involved in it. There was an emergency, as it were, a situation you might say, rather than an emergency, there was a situation which by careful planning was allowed — was overcome by procedure, not by luck.” And so I was slightly annoyed (laughs) (inaudible), pissed off by the comment of the tower. But anyway, it was a happy ending to a flight.